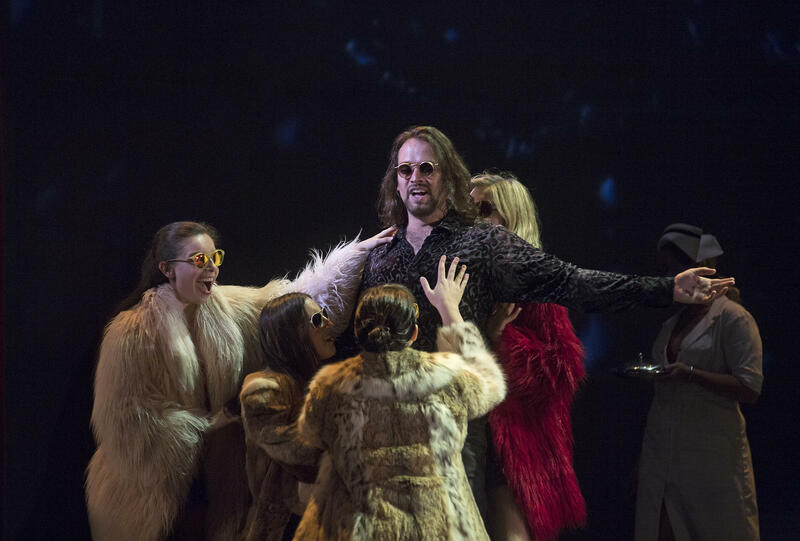 In this edition of the WVXU "Do" List, you'll find rock operas aplenty, a plethora of tequilas to try, a dash of murder mystery and more. Plus, don't forget to check out Around Cincinnati host Lee Hay's "Music Notes" for the week. The country rock group Stagger Lee Band plays the summer concert series at Uptown Park in Oxford (4 North Main Street, Oxford). Over on the East Side, Ault Park (5090 Observatory Avenue) holds its free Summer Music Festival from 6-10 p.m., featuring live music and food and drink for purchase. The eight-piece Cajun/Creole band Hot Magnolias comes to the Behringer-Crawford Museum (1600 Montague Road in Devou Park, Covington, Ky.) for a performance that starts at 7 p.m. Admission is $5 for adults and $3 for children ages 3-12. The experimental film nonprofit The Mini Microcinema screens House + Home at the Contemporary Arts Center (44 E. Sixth Street). Doors to this free event open at 6:30 p.m; the film starts at 7 p.m.
Washington Platform (1000 Elm Street) hosts "Murder on the Menu," a walking tour tracing Cincinnati's oldest unsolved murder that's followed by a four-course 19th century-themed dinner. It all starts at 6 p.m. and tickets cost $48. Northern Kentucky University's Research and Education Field Station (99 Harrison Court, Melbourne, Ky.) offers a free "Talk & Walk" on trees from 7-9 p.m. The Cincinnati Opera hosts the U.S. premiere of Another Brick in the Wall—The Opera, (pictured, top) based on Pink Floyd's album The Wall and featuring the words and music of Roger Waters. Friday's performance takes place at Music Hall (1241 Elm Street) at 7:30 p.m., with additional performances happening July 21, 26, 28 and 31. Tickets start at $35. Detroit-based indie rock band Flint Eastwood puts on a free concert as part of Fountain Square's summer concert series starting at 7 p.m. It's the last Friday Night Grill Out of the summer at Lake Isabella (10174 Loveland-Madeira Road, Loveland). The evening offers live music by Jason Ritchie and food and drink for purchase from 5-8 p.m. The Lloyd Library (917 Plum Street) debuts the exhibit "Pharmacognosy Illustrated: A History of Natural Pharmaceuticals," featuring historic medical equipment, vintage botanical art, and other artifacts that explore the world of natural drugs from the 1800s to the 20th century. The free exhibit runs through September 21, with an opening reception taking place this Friday from 5:30-8 p.m.
Cincinnati Shakespeare Company premieres the play The Complete Works of William Shakespeare (abridged), featuring 38 plays in 90 minutes performed by just three actors. The show runs through August 11 at the Otto M. Budig Theater (1195 Elm Street). Tickets start at $14. Starting today through September 9, the Cincinnati Art Museum (953 Eden Park Drive) will display the art of Robert McCloskey in the exhibit, "Make Way for Ducklings," featuring more than 100 pieces of original artwork by the Hamilton native and recipient of two Caldecott Medals. Got a taste for tequila? At Tequila Fest in Fountain Square, you can sample more than 50 tequilas, listen to live music and order a much-needed meal from local food trucks. The event runs from 7-11 p.m., and tickets cost $50 in advance; $55 at the door (which is cash only). Enjoy a free evening of orchestral pop with the UC Community Band at Winton Woods (10245 Winton Road) starting at 7 p.m.
At 8 p.m., Glenwood Gardens (10397 Springfield Pike) hosts a family-friendly Nighttime Garden Party featuring various evening activities throughout the park's Highfield Discovery Garden. Cincinnati Astronomical Society will also be on hand with telescopes and binoculars. Cost is $5 per child. The opening ceremony of the Cincinnati Neighborhood Games takes place at Washington Park at 6 p.m. Through July 28 in various locations throughout the city, you can come watch neighbors participate in such events as a 40-yard dash, hula-hoop endurance challenge, chess and more. The Cincinnati Art Museum recently welcomed back the van Gogh painting "Undergrowth with Two Figures" and to celebrate, Listermann Brewing Company (1621 Dana Avenue) will release a special van Gogh-themed beer during a launch party at its taproom starting at 10 a.m. Listermann will donate 10 percent of all of this can's proceeds to the Cincinnati Art Museum. Starting at 1 p.m., Kennedy Heights Art Center (6546 Montgomery Road) holds "Jazz in the Heights: Tribute to Horace Silver," part of its summer concert series featuring renowned jazz performers and benefitting the center's arts programs for low-income youth. This show features The Horace Silver Project, a quintet created by jazz pianist Phil DeGreg. General admission is $25; $30 at the door. It's the last two performance of The Bradbury Tattoos, A Rock Opera, at Memorial Hall (1225 Elm Street). This original opera crafted by concert:nova is inspired by the tales in Ray Bradbury's The Illustrated Man and features a cast of storytellers across four stages. Final shows take place at 5 p.m. and 8 p.m. Tickets are $40; $20 for students.